Rare is the Era in which so much power has been concentrated into so few hands. This is the Chronicle of such an Era. Defiance is a miniatures battle game set in the Orion and Perseus Arms of the present day Milky Way Galaxy. It is here that the Vobian Hegemony, once undisputed masters of the known universe, struggle against the machinations of its former subjugates, the Meraxillan Sovereignty and Altai Realms, all against the backdrop of an extra-galactic invasion. Within this epic dynamic, the abducted colonies of Earth have coalesced into a Confederacy of States that for the first time suggests that Mankind itself will become ascendant. 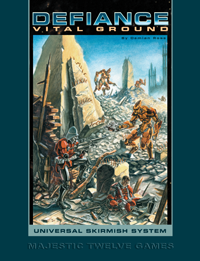 Welcome to the Defiance Universal Skirmish System, the game of near future and science fiction tactical combat that lets you modify or even create the strategic setting in which your battles will take place. With force sizes varying from one unit to several platoons, each trooper matters, and the correct combination of mobility, firepower, command and control is crucial to your success. The U.S.S. Army Customizer is a comprehensive and statistically-based force construction tool that literally allows you to design any weapon, any trooper and any army that you can imagine, all the while being assured that your creation will be balanced for play against any other U.S.S. force list. A lot of work and testing went into the Customizer, and we feel that you will not find a more versatile or more balanced universal force construction tool on the market today. CHRISTOS SOTIRAKOPOULOS 9 9 9 From simple to complecated skirmish battles. Very good!